As New Yorkers, we are used to waits and have often become cynical about it. I mean how many hours do we have to spend in line waiting for something before we finally say “You have got to be kidding me right?” Fortunately, I am not quite there yet so I found myself waiting in line with a clusters of others in a similar mind set at Paulie Gee’s in Greenpoint one early Saturday evening. An hour wait at 5.30PM? No worries, we spent our minutes exploring the neighborhood as so should you. There are some really adorable gems within close vicinity to the pizzeria in this up and coming neighborhood. Do remember to check your time though because it will fly by and you don’t want to lose your spot in the line. We returned to the dark rustic restaurant fifteen minutes early and managed to swoop in as two seats at the tiny bar opened up. Success is sweet even if it only reduced the wait by a few minutes! We didn’t waste any time on the salads and soups section of the menu, not for the first time anyways, and dove right into the pizzas. 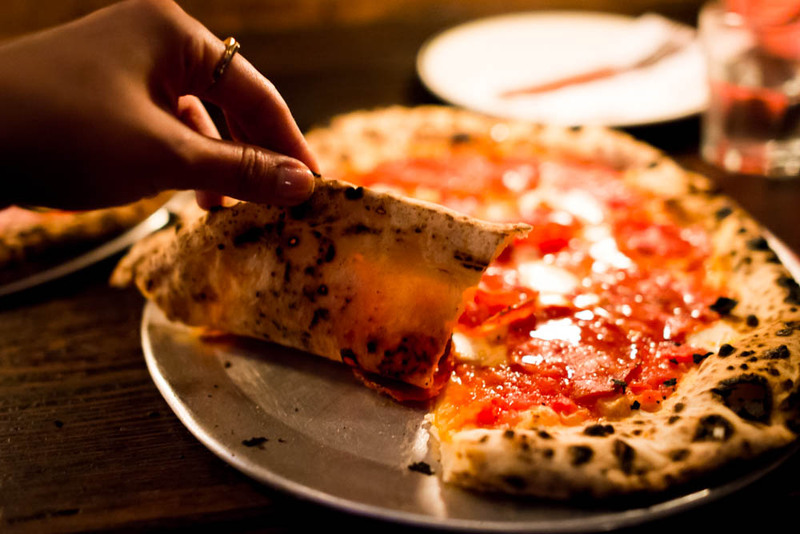 Our first pie was the Hellboy, a fresh mozzarella and Italian tomato pie topped with Berkshire sopressata Picante and parmigiano reggiano. What made this addicting was the generous drizzle of Mike’s Hot honey. A quick check of the charred crust with an undershot before we dug in. 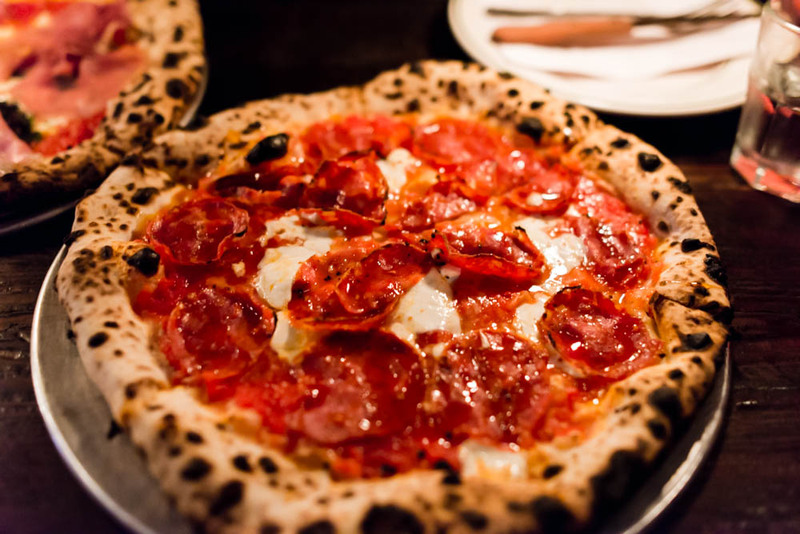 The crust was unbelievably thin and the soppressata piccante brought a lovely heat accentuated by the honey that initially gave it a sweet note before turning up the heat. As we were still enjoying the Hellboy, our second pie, King Harry Classic, arrived. 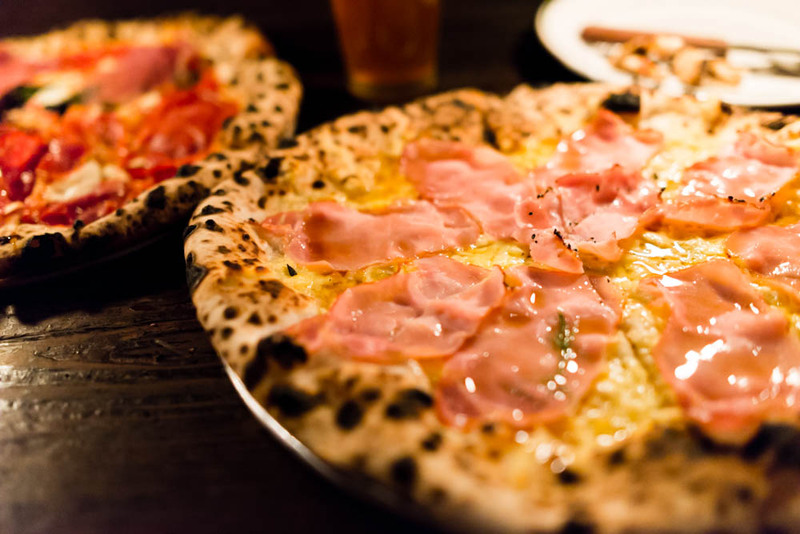 The fresh mozzarella and tomato pie was topped with more traditional ingredients, a little bit of pecorino, a flutter of fresh basil leaves and translucent sheets of proscuitto di parma. Not quite sure who King Harry is but this is a fabulous combination of classic flavors indeed, no surprises here. We were originally going to settle with two pies but we got a little ordering envy when we saw a third pie hit our neighbor’s table. Screw diets, we are going for another one. To make ourselves feel better, we told each other that we were skipping dessert. After all, the Monte Cristo, a white pie with mild gouda and sliced Canadian bacon, was finished with a splash of maple syrup. This was Paulie Gee’s take on the pineapple and Canadian bacon pie that we all know and love. Sweeter than the Hellboy, we happily finished dinner with a few slices of the Monte Cristo, licking up the sweet maple syrup. So my conclusion? Somethings are really worth the ridiculous wait that we still somehow put up with as New Yorkers and the pies at Paulie Gee’s were definitely worth it. 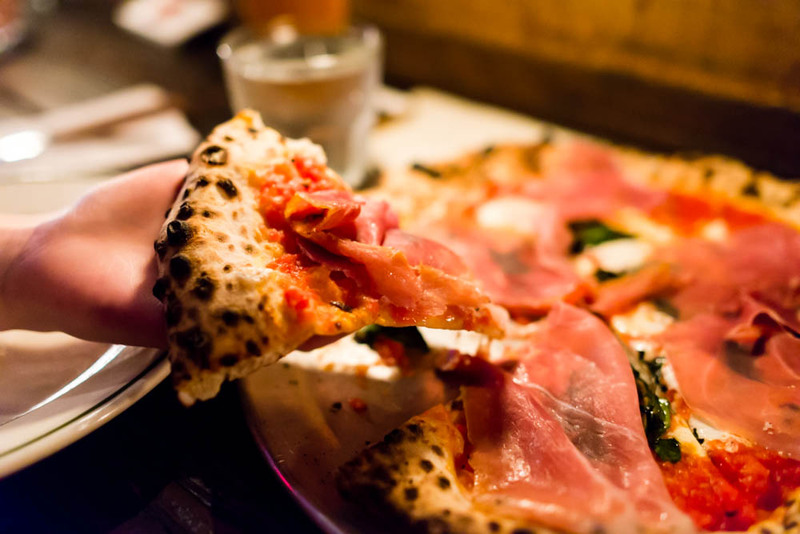 The unique combinations and fresh ingredients coupled with spot on pizza techniques have and will continue to attract the throngs of people who venture out to Greenpoint for a taste, me included.